Review Fix chats with Much Fun Games’ Murari Vasudevan and Fabio Franconeri who discuss their platformer “Mirror Man,” breaking down the game’s development cycle, gameplay elements and reasons why you should check it out. Murari Vasudevan: The idea for Mirror Man came during a 24-hour game jam at the London Science Museum. They challenged us to explore the concept of ‘Deception’ with a video game. We always had a thing for action games so we asked ourselves: what if the game tries to deceive the player? Shows them things that aren’t there, misleads them, with objects that are mere apparitions, projections of things that don’t really exist? And that naturally led to the concept of two parallel worlds that coexisted at the same time, and the split world as a metaphor for the imagination. Review Fix: Can you talk about the gameplay elements at work here? Fabio Franconeri: At its heart, it’s delicately balanced twitch gameplay – the player has to make instinctive decisions based on things that quickly move on the screen. The twist, though, is the 2 worlds – you need to mind them both, which plays with your mind quite a bit at first. It becomes easier as you learn the obstacles and their combos, but the game does slowly ramp up in difficulty the further you get. Popping the apparitions fills your sanity bar which, when maxed out, gives you a burst of invincibility that lets you tear through a couple of sections. And finally, there’s a head-start feature which you can earn with the in-game pills you’ve collected, which lets you risk starting at a much-higher level, but with the potential of easily beating your high score. So a lot of risk-reward elements at play here. Vasudevan: As any indie developer will tell you – it isn’t all roses. Getting a game idea into a fully developed game, ready for market is a tough journey that requires a lot of commitment and constant dedication. After the initial excitement and momentum, however, we stagnated, and went through many iterations of artwork and concept, while also sorting our lives out. We also went through at least one major change in direction when we realised that we didn’t have the bandwidth to make anything too art/story intensive and we aimed instead at a fun, free, casual game. So we kept at it, working any spare evenings and weekends, and all of a sudden, a year or so after, it started materialising. We handed it to people, got some very positive responses, which spurred us on even more. And here we are. Review Fix: What games did you play as a kid? How did they influence this one? Franconeri: I’ve been a gamer all of my childhood and early adolescence and eagerly played pretty much any games I could get my hands on for any of the major platforms. I started with a Commodore 128 and then got a Sega Mega Drive and later a Super Nintendo. I couldn’t convince my parents to get me a PC back then but luckily I had friends whose parents had one and I would go visit them regularly and play. Vasudevan: A lot of platformers in the late 80s / early 90s – Super Mario on the NES to start with, Contra, Prince of Persia, Sonic on the Genesis – followed by PC/DOS gaming, the likes of Commander Keen and Earthworm Jim. In addition, as a 90s kid, I had the usual – FPS (Wolf, Doom, Quake) – RPG / Adventure (Tomb Raider, Soul Reaver, Morrowind), the list goes on. For Mirror Man, the inspiration though didn’t so much come from those early days as much as from the new wave of retro-style running games – like Canabalt – that we started playing during our university years. We were very impressed by how these games managed to mix the nostalgia for pixel art with a highly dynamic gameplay that was definitely missing in 80’s and ‘90s games. Review Fix: What do you think is the coolest feature in the game? Vasudevan: Its use of symmetry. You can flip your phone upside down (or flip yourself upside down) and still play the game almost entirely the same way. We were very concerned that controlling two characters at once could prove too challenging and discourage people from even trying to play the game so we’ve been very careful with getting the design just right so it wouldn’t scare people off while maintaining the intended level of challenge that ultimately makes it fun. 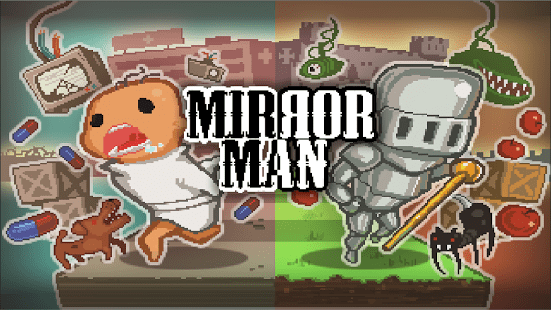 You need to stay focused to play Mirror Man, but not so much that it makes your head hurt! Review Fix: Bottom line, why should someone play this? Franconeri: Because it brings you the same sensation of challenge that games like Flappy Bird or The Impossible Game do without frustrating you to no end! And because it’s something different. And fun. Hickey Jr.: What are your goals for the game? Vasudevan: Ideally, we’d love it if we made enough money to make the next one, and keep our indie dreams going. For now, we’re just focusing on getting it played by as many people as possible. Franconeri: We have a whole story in mind for our little character and with the next release, players will see the world change as they progress through higher levels. We’ve got a ton of updates planned, both gameplay and sheer content – power-ups, characters, worlds, new game modes, bosses, you name it.